My plan for today was to spent a few hours in the art studio to create something, anything to get my artistic juices flowing. I didn’t have anything in mind particularly and sure enough when I sat down at the table and surveyed a blank white page I froze. My brain just couldn’t get started. There are so many ideas that float around in my head, but for some reason I just couldn’t decide where to start. 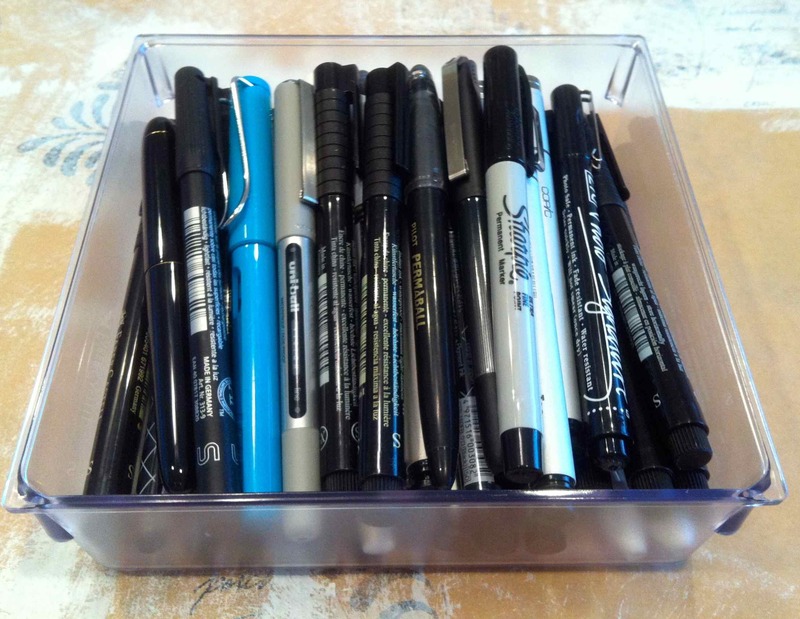 So I started sorting through my container of black writing pens. and wrote with each one, making a list of each with their name and size. 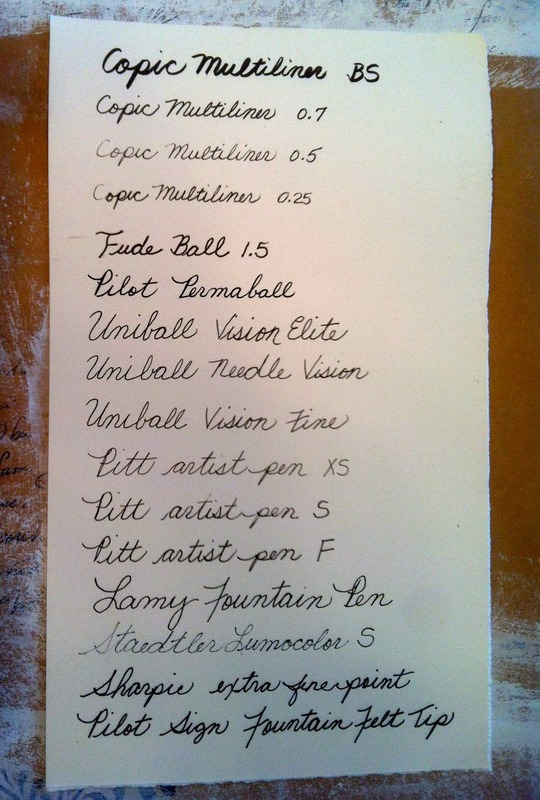 My favorite is still the blue Lamy Fountain Pen. I love the way it feels in my hand and the smoothness of the ink as it flows onto the paper. I just opened the Pilot Sign Fountain Felt Tip pen (the one on the bottom) and love the way it delivers the ink through the felt tip. I’ll be testing this one out to see what it will write over. Why do I have so many black pens? I have yet to find one black pen that will write over all of the different surfaces (acrylics, watercolor, gesso, acrylic ink, watercolor crayons, oil pastels, gel medium, etc.) and remain permanent (no smearing if you paint over it). 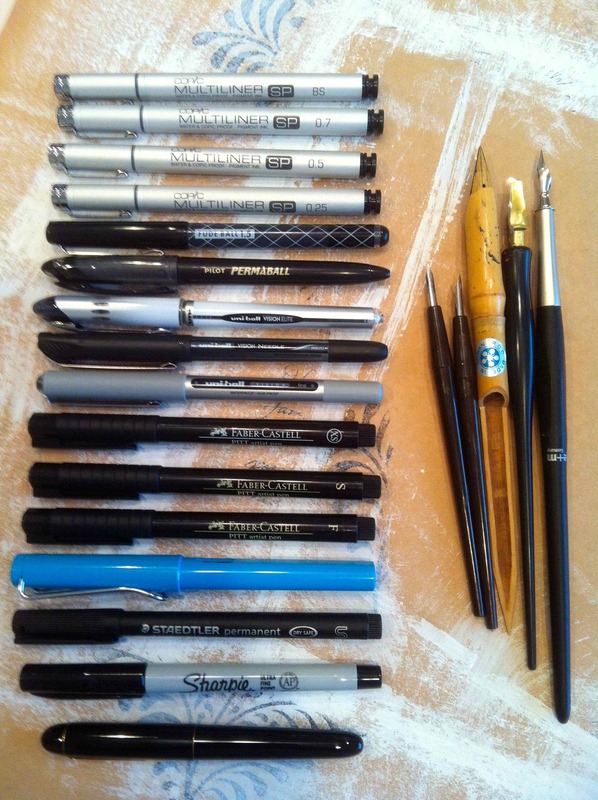 What’s your favorite black pen? What would you recommend to try next? What a fun and therapeutic way to spend an hour. This list will be added to my List Journal. Now on to document some of my other art supplies. This entry was posted in 2012 and tagged supplies. Bookmark the permalink. Great post about pens! I am asked about this all the time and I appreciate this! 🙂 Have a blessed week!